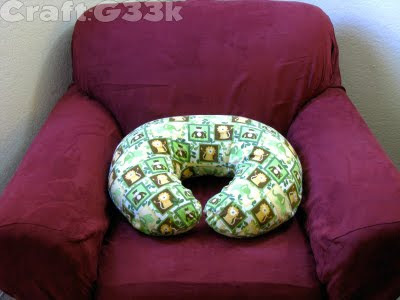 I found a free Boppy cover pattern courtesy of Vanilla Joy, and it was very easy. I used Joann Fabrics snuggle flannel, which is deliciously soft flannel that goes on sale frequently. The pattern isn't perfect -- I think it might be from before Boppy changed it shape to be more "generous" in the waist area, but it is close enough, and the directions are very easy. I would recommend that if you use this fabric also, and care about how perfect your Boppy slipcover is, that you stay stitch it before you get started, because it stretches quite a bit around the curves. I didn't, and I had to fix it in a few places. I didn't have a zipper, so I altered the pattern to use buttons. To do this, I rolled the hem of the back bottom piece, and I used front pattern pieces 1 and 2 instead of the shortened back top piece as the top, and also rolled that hem. Then I made loops out of my scraps and attached three buttons. Look! More cute fabric, and cute buttons too! I really like your idea installing buttons with loops. I made 2 covers with zippers, but a time getting the boppy form inside. I think I will try that next time Lord willing.